Just How Similar Are Earth's And Mars' Landscapes Really? Much of the information we've gleaned about the Martian surface is based on the idea that we can explain some of what we see using Earth-based parallels. But how often do the two really line up? Using Earth comparisons has been extraordinarily useful to researchers who have used them to answer questions on everything from subsurface glacier movements to whether we could grow crops there. Sometimes, though, the Martian conditions are so different that what makes sense on Earth is turned completely on its head in space conditions. Are These Mountains On Mars Hiding Ice Just Beneath Their Surface? I've been studying patterned ground for my PhD research, in particular looking at possible analogues on Mars. There are a lot of different types, the main classifications being sorted and unsorted features. Unsorted features are often fracture polygons of some sort which likely form as a result of thermal contraction cracking, exacerbated by a suit of processes such as sublimation, and the development of ice and sand wedges. The features you illustrate are of this type, occurring around a frost mound or pingo, you can see where the fractures have infilled with water, and in some places large ponds are developing, likely due to increased thaw of the ice in a process called thermokarst. Thermokarstic features often develop at the intersections between fractures, as the ground ice is especially exposed at those locations and so more easily thaws. Sorted features are more complex, as they are likely polygenetic. It is established that they result form the freezing and thawing of the permafrost active layer, but a variety of mechanisms have been proposed, most of which involve feedback loops. Some of the patterns they produce are striking and if similar features on Mars are produced by the same processes then it could have important implications for determining where water could be liquid, since thaw is required for the formation of sorted patterns. 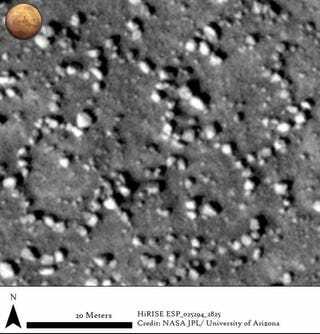 Here are some boulder circles (or almost circles) In north eastern Acidalia Planitia on Mars. One hypothesis is that these are similar to terrestrial patterned ground, but forming on a much larger scale. There are also studies that suggest they could form through more exotic processes such as the interaction with CO2 frost. It's a HiRISE image, so the pixels are about 25 cm. So each of those boulders is a few metres across.